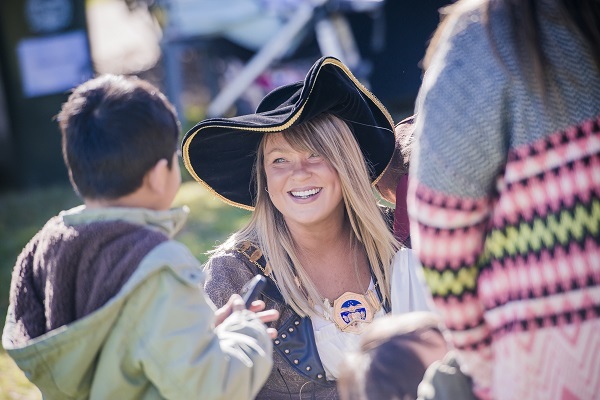 More than 600 children and their parents met with The Hills Shire Mayor, Councillor Yvonne Keane at Heritage Park in Castle Hill to discuss what they would like to see for the future of The Hills Shire. Mayor Keane said she received wonderful feedback which will be used to inform Council’s Community Strategic Plan – The Hills Future. “We had a great time discussing and drawing what children and their parents felt was important to them during a fun and educating time traveller’s treasure hunt with children’s entertainer Sam Moran,” Mayor Keane said. “Discussions focused on transport and how Council could investigate innovative approaches to easing road congestion, adding more footpaths and creating carless city centres. “Other attendees wanted to see more open space, social hubs and sports and recreational centres delivered for the community. “I appreciate everyone taking the time to provide feedback on our plans for the future. “Council will now use these amazing ideas to develop strategies which will see our region re-imagined into the best it can be for our current and future residents,” Mayor Keane added. The Heritage Park event was held as part of Council’s pop-up park consultation series. The series aims to engage residents in discussion surrounding their local area. Mayor Keane said with increasing numbers of people, especially families, moving into The Sydney Hills, Council was committed to continuing a range of consultation activities to ensure community needs and aspirations were articulated and considered as part of planning, design and delivery of projects. “It’s important to understand the needs and desires of our residents, ensuring they are part of the plan for the ongoing success of The Hills,” Mayor Keane said. Residents will again have an opportunity to participate in consultation activities at Orange Blossom Festival’s ZESTFest on 27 August – look for the community consultation stand open from 11am to 3pm in the community grove section of Bella Vista Farm.